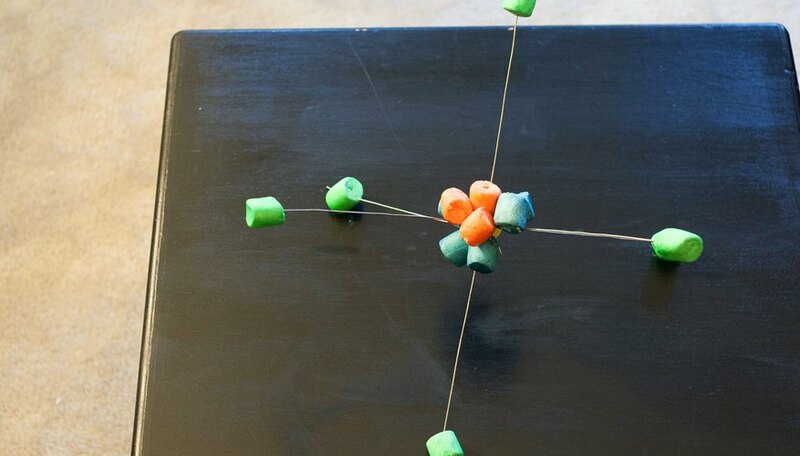 Making an three-dimensional atom can be an interesting and educational project for a child. A 3D atom model gives him a better idea of what atoms look like and how they work. For an added educational effect, have him write a short paper about the type of atom he creates. There are many different atoms you can chose from when starting your 3D atom project. Some atoms have more components than others do. If your child has a short attention span, use an atom with very few components so the project is easier for her to finish. For example, hydrogen is the smallest atom in existence and you can create a 3D model of one without much trouble. As the atoms increase in atomic weight, the more components the atom has. The three physically solid components of an atom are protons, neutrons and electrons. You can use a wide range of materials to make the different atom components. 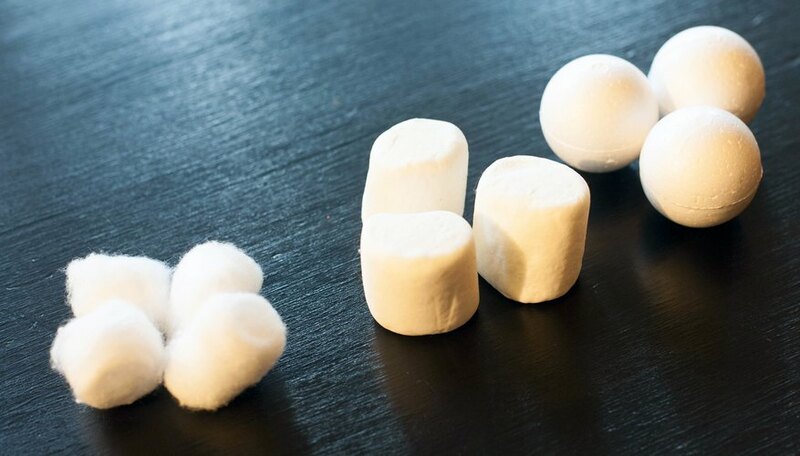 Children might enjoy using marshmallows for the different components of the atom, but almost anything that you can puncture will work. For example, you can use foam balls, clay or cotton balls. Use items with a spherical shape for accuracy since the components of an atom are spheres. Your child needs to be able to identify the different components of the atom. When you use identical materials to create the different components of the atom, it can be difficult for him to determine what part is what. You can use multicolored materials (for example, multicolored clay for each component or you can color the materials yourself. 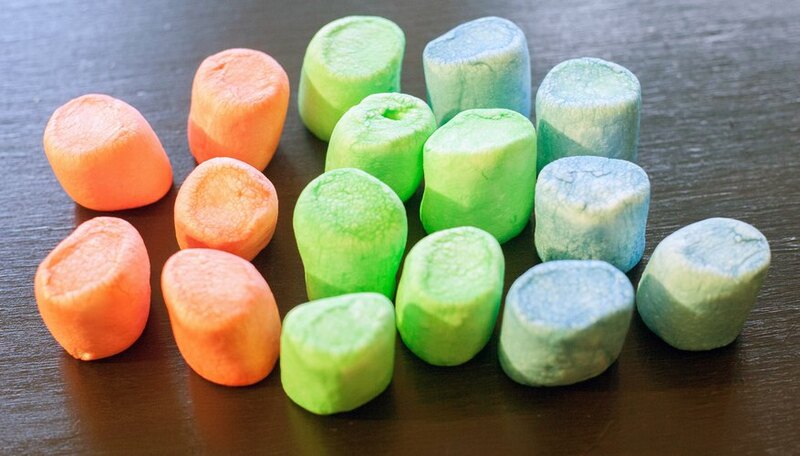 If you use marshmallows for the components of the atom, you can dip them in a water and food dye mixture to give them color. If coloring the materials isn’t an option, use labels to help identify each component. The nucleus of the atom is one large mass of neutrons and protons. 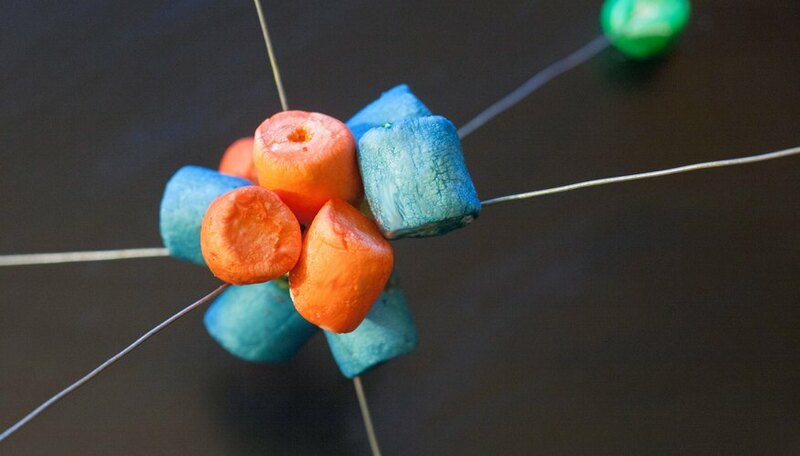 You can use glue or popsicle sticks to hold the nucleus together. The electrons orbit the nucleus, so you need some long wire to stick into the sides of the nucleus that will hold the electrons at a distance. You can use old wire hangers to connect the electrons to the nucleus or you can use lengths of coiled wire. The wire should be strong enough to hold the electrons in place without bending. Hazelton, Shae. "3D Atom Model Crafts for Kids." Sciencing, https://sciencing.com/3d-atom-model-crafts-kids-8452024.html. 24 April 2017.